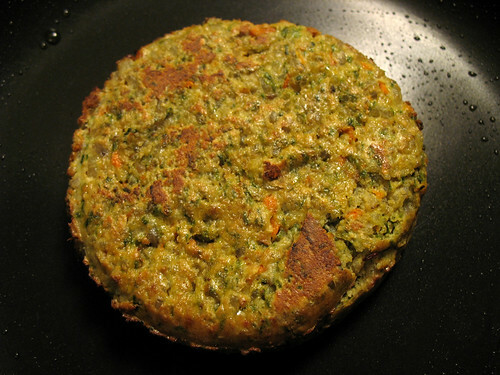 I wanted to try a new brand of store-bought veggie burger, so I picked up a box of these the last time I was at Whole Foods (which has by far the biggest selection of frozen veggie burger patties). 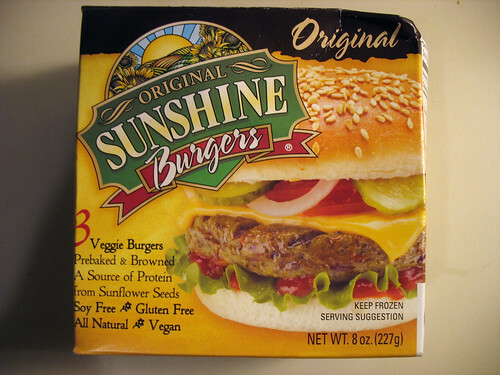 I’d never heard of Sunshine Burgers before, but they looked good (and weren’t as expensive as some of the other options!). The box says “not meant to be a beef imitation but an excellent flavor sensation of their own” – that’s my veggie burger philosophy too! These patties are organic, vegan, and gluten-free as well. I fried a patty (frozen, straight from the freezer – I never let them thaw, and some packages even tell you not to) with a little bit of olive oil on my stovetop. And because I was craving sweet peppers, I sautéed a few slices of those for toppings. With barbecue sauce. Yum. 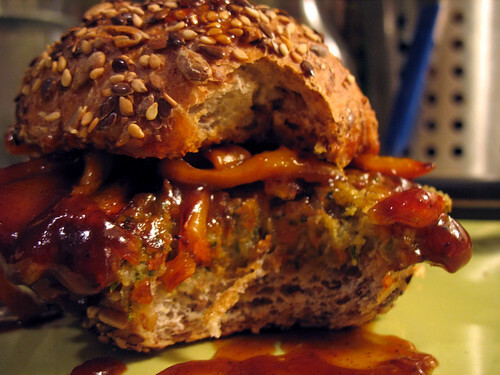 The patty was delicious – the flavor was very rich and nutty. Slightly sweet but still savory. If you don’t like sunflower seeds, I can’t imagine you’d enjoy this, because it tastes very strongly of them. But that was a plus for me, as I enjoy them quite a lot. The ingredients are so simple – listed on the box as brown rice, ground raw sunflower seeds, carrots, herbs, and sea salt. That’s it! But so tasty. And yes, that’s one of those amazing buns that I buy at my local Greenline Organic Grocery. These buns are my first choice for making burgers at home. I was really, really craving barbecue sauce at the time. While nothing beats the convenience of the Morningstar and Boca products that my local grocery store carries, and nothing beats the price of Trader Joe’s burgers… as far as taste goes, these Sunshine Burgers may be one of my new store-bought favorites. I bought the “original” but on their website it looks like it comes in other varieties too, so maybe I’ll try one of those next. Damn I missed out on these! 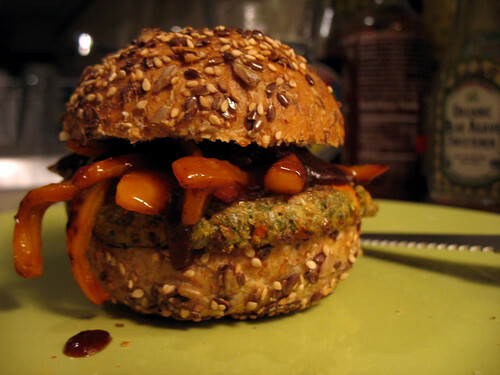 I need to have you over for veggie burger cooking soon. Highly recommend the Sunshine Breakfast burgers. I've tried all the Sunshine(flavors? )patties and they have been my favorite. I stock up on them when they're on sale. Boca burgers, and perhaps Morningstar are from genetically engineered seeds who's DNA is changed with a bacterium to basically drinking herbicides. The herbicide of choice is often Monsanto's Roundup, which is strongly linked to gastrointestinal health damage, cancers, spontaneous abortions, and more. Try them. They are said to be rich in Omega 3 and other nutrients, and because they are not grown with synthetic pest controls, they are healthier for your body and the planet.